One of the more interesting introductions at this year’s PGA Merchandise Show was a family of clubs from Tour Edge Golf called Hot Launch 3 with members running from two versions of the driver down through wedges. Over the past few years the number of models in the premium and ultra-premium price categories has continued to grow as manufacturers look to increase revenue in a stagnate market. Tour Edge on the other hand with the HL 3 family is taking a different approach and making a major push at the other end of the price spectrum. Company founder and master club designer David Glod makes the point that HL 3 drivers for example don’t take a back seat in performance to those at two or even three times the price. A rather refreshing approach to say the least and fortunately for golfers Tour Edge has carried through the same relationship of price and performance in the other of models in the family. The standard and Offset versions drivers are each priced at $189.99 and both feature a variable thickness titanium cup face to preserve ball speed on off center impacts. They have a channel in the sole behind the face’s leading edge to lower ball spin and make the head more forgiving plus there’s a fixed rear sole weight which moves the center of gravity rearward to produce a higher ball launch. Lowering the ball’s spin and pushing the ball’s trajectory toward a more ideal angle are key to getting the most distance from a given swing speed. In the Offset version, the entry point of the shaft into the clubhead is further forward, i.e., closer to the target, which is more of a “slice-fighting” configuration than the standard. He continued, pointing out the company has plans for 1,000 custom fitting centers each having a mobile custom fitting bag filled with HL3 clubs. This will give golfers of every skill level the opportunity to test and be properly fitted with clubs that will maximize results for their particularly swing. 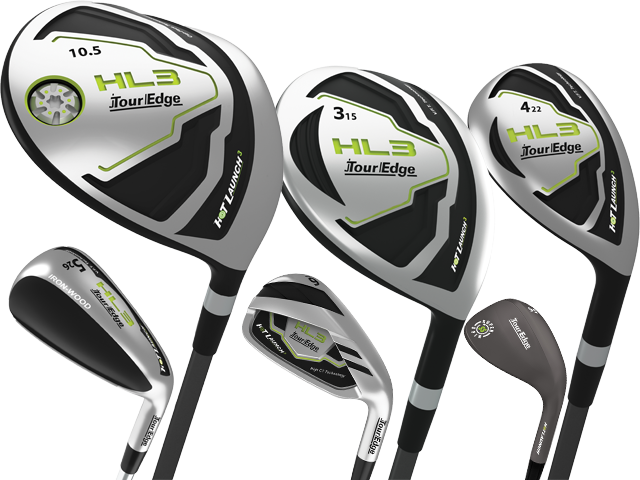 The standard model HL3 driver will be available in lofts of 9.5- and 10.5-degrees and the HL3 Offset in 10.5-, 12- and 13.5-degree lofts. Both come with a proprietary UST Mamiya stock shaft weighing from 48 to 60 grams depending on results of the driver fitting. HL3 fairway woods, either standard or Offset, are priced at $139.99 with the hybrids at $119.99. A set of HL3 irons (4-PW) is $419.99 with steel shafts and graphite shafts are $70 additional. Adding to the player-friendly choices are forged face Iron-Woods (a category Tour Edge pioneered) at $79.99 with steel shafts or $89.99 with graphite in a range of lofts from 18 degrees to 59 degrees. Iron-Woods make an ideal way to mix-and-match with fairways woods, hybrids and irons to make up just the right set. Taking a standard version HL3 driver to the course provided the opportunity to see results under actual playing conditions rather than simply a few swings on the range or pounding balls into a net. For comparison drivers from two different manufacturers, both with a custom fit after-market shaft, were also put in the bag. Using Titleist Pro V1 golf balls for all the tee shots we saw the Tour Edge HL3 could certainly hold its own. My driver swing speed is 96 to 98 mph and to achieve the most realistic comparison all three drivers were hit on every par four and par five. Without question the distance using the HL3 was essentially the same as the more expensive drivers given the variations in wind, slope and firmness of the landing area and the usual variations in my swing. Also, it was apparent the dispersion left and right with the HL3 was probably somewhat less but since actual measurements were not done we called it “comparable” to the other two drivers. Does this mean you should rush right out and buy an HL3? Of course not. This is all about is what works for you not some guy writing a review. What it does mean though, if you are in the market to replace your one-wood the Tour Edge Hot Launch 3 should be part of your consideration. After all, it only makes sense to find clubs that fit your game and produce the results you need at a price that doesn’t bust the budget.